The theme song alone is enough to see this film. You might as well get the soundtrack right away, 'cause you'll definitely want to listen to it later. 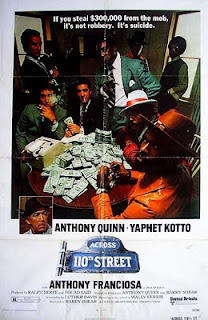 Across 110th Street doesn't feel like a movie. It feels like something that's happening now, right across the street. It's gritty sepia story grinds along, spraying dust and lowbrow insults in all directions, as wet cardboard fly across the screen, like tumbleweed. When it comes to blaxploitation, it doesn't get much better than this. Black has never been as beautifully bodacious.